High Frequency Words are the most commonly used words that we read and spell. 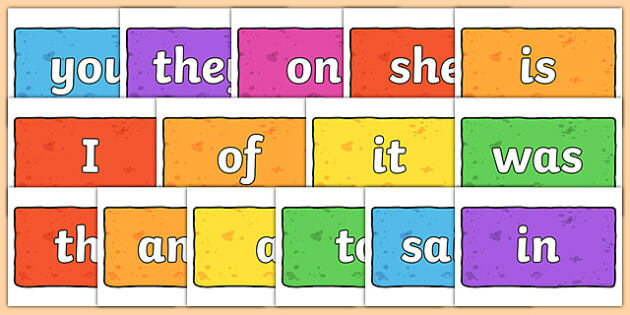 Words such as the, said and was are examples of high frequency words. The days of the week, colour names and number names are also considered high frequency words. In the past, students were taught to learn the words by sight. This idea supposed that learning to read these words by sight would help students read increasingly difficult texts more easily. The problem with this theory, is that there are approximately 100-400 words commonly listed as high frequency words. To learn all of these by sight is an unreasonable expectation. Our working memories can only take so much! How are high frequency words learned at MacKillop? At MCC students are taught to ‘code’ all words, including the high frequency words. This means that students identify the sounds they hear in the words and how these sounds are represented (spelling choices). In learning the code of the words, students are then able to apply this knowledge and skill to other words that they read and spell. High frequency words are presented in code so students can ‘see’ where the different sounds are and how these sounds are represented in each word e.g. in the word was the students can see that there are three sounds and that the second sound is represented by a. This knowledge can also help them identify with words such as swan where the third sound is also represented by a, even though the word swan, is not considered a high frequency word. Instead of just trying to learn all words by memory- an impossible task, students are systematically taught the code and can then apply this knowledge to other words, including new vocabulary. Learning the code helps with reading and spelling. It makes sense to learn to read and spell words simultaneously. At MacKillop, students need to demonstrate that they can read high frequency words, identify the sounds in the words (using duck hands, lines and numbers) and write the words so they can use them in both their reading and writing.